_MAL3461, originally uploaded by Michael A. Lowry. This morning I met Matt and Lisa at T-Centralen, and went down to Kolartorp in Haninge. It's a forest that lies a few stations south of the city by commuter train. I've gone mountain biking there before — the area is also called Rudan. This was my first time to do any bouldering on real boulders, and I had a blast! The folks we met there, including Jenny, Patrik & Isabelle, showed us the best places and let us share their crash pads. 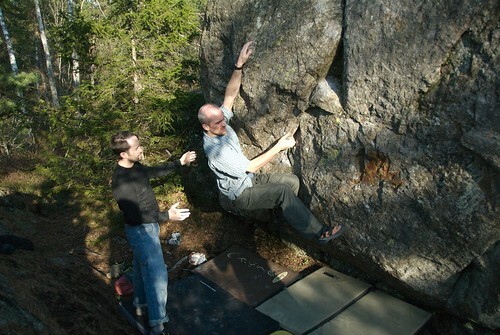 I posted 69 photos from today's bouldering excursion. /p u t t E "Patrik"